Have you ever experienced the power of prayer in your life? At Breakthrough Prayer Ministry, we seek to unite those who need prayer with those willing to pray. 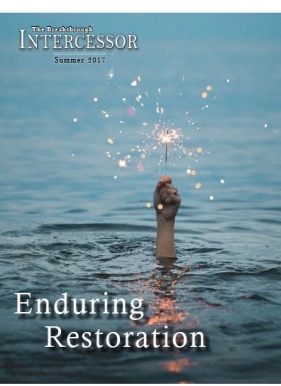 Read about God's power to RESTORE in the Summer 2017 issue of The Breakthrough Intercessor. Read about how one woman found rest in a world of distraction and about how God restored a prayer life through reminders from the past.